Legendary detective Sherlock Holmes is best remembered for solving mysteries in the London fog, clad in a flowing cape, deerstalker hat and puffing on his pipe. Holmes, portrayed on screen for almost a century, has been spruced up for a lavish new outing starring Robert Downey Jr as the quintessential Englishman. Gone is the deerstalker in director Guy Ritchie's film, as Holmes takes to the streets to save 1890s London from a dark foe. 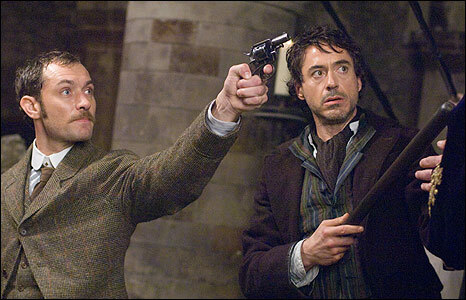 Holmes uses his fists as much as his razor sharp mind in a string of high-octane action sequences, and is "flawed, selfish and suffers from depression," according to Ritchie. He says he wanted to create a Holmes not "contaminated with previous symbols", but insists there is a strong association with Conan Doyle's original work. "There were the first stories I was familiar with from about the age of six and I knew them extremely well. "From a very young age I had an image of Sherlock Holmes and feel I drew most of my creative ammunition from Doyle," adds the film-maker. Downey Jr, who brings a bohemian, slightly bedraggled feel to Holmes, says he knew it would be a fresh interpretation drawing on original sources. "Sometimes you just feel you're in the right groove and being silently approved from some other place and time," he explains. "There were times when we were so locked into how Doyle expressed things, but we had to twist it up. "We were honouring it but still being entertaining," says the Hollywood star. Actor Jude Law, whose handsome, debonair version of the traditionally bumbling Dr Watson has turned him into "Hotson", says the film was about rediscovering the 19th-Century stories. "They were coming to me not to put on two stone and fool around putting my foot in the wastepaper basket. I was going to play Watson with a bit more edge. "It was a happy juggle between going back to Doyle, relishing in the accuracy that had been overlooked before and adding new energy to it," explains the star. "You see them unpicking cases on a cerebral level, but they're also out and about getting their boots dirty and knuckles sore." Ironically, Law's second acting job in 1991 was playing a stable boy with a secret in a Sherlock Holmes TV mystery. Lionel Wigram, who wrote the screen story for Sherlock Holmes, adds that authenticity was "essential". "In every scene we tried to have at least one piece of Doyle's dialogue and harvested his stories for as much rich detail as we could put in there. "There is a reason Sherlock Holmes has lasted 122 years - because the stories are so good and he created such amazing characters." Producer Joel Silver, whose previous credits include the Matrix and Lethal Weapon films, says that the original Holmes movies were "stuffy". "They were rug and dust movies, interior films. We've made a contemporary film which feels fresh and original but still embraces what Doyle did. "It potentially has franchise capabilities," he says. "You want to have a place to go with a movie, and we tried to allow the audience to embrace the fact there may be more of a story." 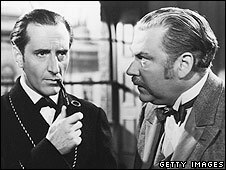 While arch-villain Lord Blackwood is a new creation, there is a shadowy appearance by Holmes's nemesis Moriarty, suggesting he is being primed for a possible sequel. The actor who might play the evil professor, however, remains a closely-guarded secret. While the film boasts a rich soundtrack and a vivid recreation of Victorian London, at its heart is the relationship between Holmes and Watson. Ritchie says he wanted more of a "partnership of equals" than the tradition of Watson's dullness bringing Holmes's brilliance into sharp focus. 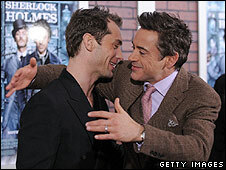 As for Downey Jr and Law, they say it is an acting union that has proved a success. "We started work the minute we met," says Law. "Usually they say 'you and a female actress have got this great chemistry' but they're talking about Jude and me like we should be making romantic comedies!" jokes Downey Jr.
"This film is not a comedy but it's a love affair of sorts. Holmes and Watson are aspects of all of us. We're just a good team," he adds. 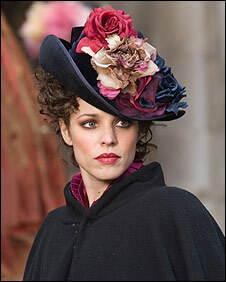 Sherlock Holmes is released in the US on 25 December and comes out in the UK on 26 December.